Fall River is a small, local campground that is an excellent place for a family outing, for enjoying solitude in a beautifully wooded area, or for cooling off on a hot summer day by drifting on the river. 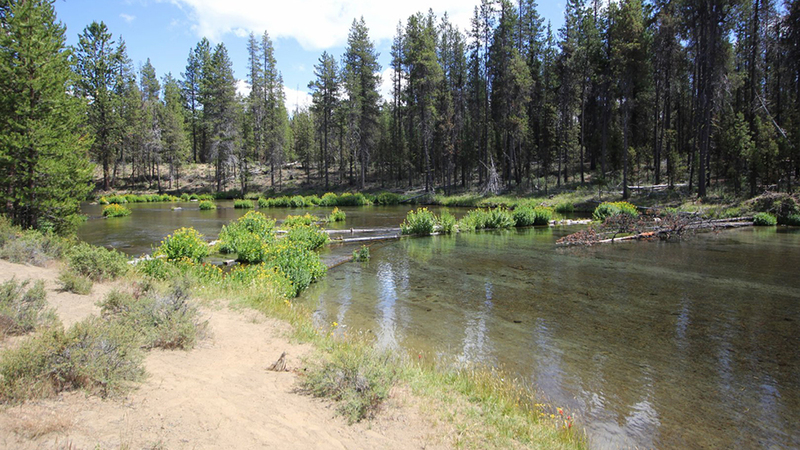 The campground is 30 miles south of Bend and is located next to Fall River, a beautiful spring-fed stream that flows to the Deschutes River. Access to day hikes is convenient, as Fall River Trail leaves from the campground and follows the river. The area is also very popular with fisherman casting along the banks of the water and in non-motorized boats. Fly fishing is allowed with barbless hooks, and Brown, Rainbow, and Brook trout, and whitefish call Fall River home. Fall River Campground is made up of 12 sites and, while reservations are not taken, there is almost always an empty site available. The fee is $10 per night for the first vehicle and $5 for each additional vehicle. Vault toilets serve the entire campground but be aware that there is no drinking water available.